Let little slimemasters explore slippery science through 15 different experiments. Every kid's into something different, but there's one thing they all agree on: Anything gooey, slimy, and stretchy is 100% awesome. 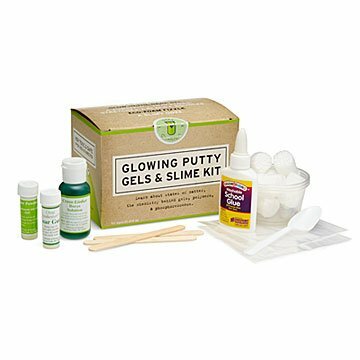 Let your little slimemaster explore the cool chemistry of gels, polymers, and glow-in-the-dark stuff with this set of 15 experiments. Follow the simple instructions and they'll be creating mad-scientist matter in no time, like glowing gel, fizzing eco-foam, and of course, slime. Think it's just one big gross-out? Guess again: It encourages hands-on creativity and problem solving along with serious science. The box includes everything you need for a slimetastic time (all non-toxic when used as directed). For ages 10 and up. Adult supervision recommended. Made in North Carolina.